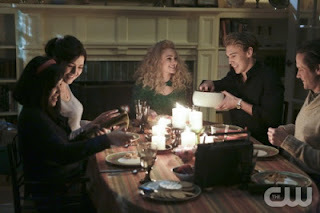 This week on The Carrie Diaries, Carrie channels her late mother and prepares a family Thanksgiving dinner with help from Mouse. Plus, Maggie spends an awkward dinner with Walt's family and an unexpected guest arrives at Carrie's door. Dorrit, defiant as ever, goes off on another dramatic tirade and smokes weed in the privacy of her bedroom. Unfortunately for Carrie, this little distraction caused her or Mouse to not notice the food burning in the stove. No one could have saved that mess in time! If you thought Dorrit was over-dramatic, Carrie set off all her inner resentment and let loose on her father in front of EVERYONE. Cooking can be a stressful task and Carrie just really needed to let out all her frustrations towards Dorrit and her father. Though, I wouldn't be surprised if she was channeling "Carrie" from the Stephen King book instead of her mother. The power went out, the party died and she was left to pick up the pieces yet again. Not everyone knows by high school what they want to do in life - Maggie is currently in the same boat. Is a university education in her future or will she be stuck in Castlebury forever? While spending Thanksgiving with Walt's VERY proper and upper-crust family, who clearly don't like Maggie or want anything beyond perfection for Walt's future, the dinner has left her thinking about the future and asking her simpleminded brother what could be in store for her. Also reemerging this week is Maggie's casual hook-up buddy who gets shut down when he's looking to start up their previous relationship. Maggie really needs better taste in men! Carrie has a mysterious power over the bad boys - they can't stay away from her, even when they're broken up. After his neglectful mother bails on dinner, Sebastian shows up at Carrie's door in the middle of the night to talk... just talk. (And clearly shunning Donna in the process. One point for Bradshaw!) The conversation is his way of hoping to reignite a relationship but Carrie clearly turns him down in the nicest and subtle way possible. He made his decision and now he has to live with the choices - they can't go back... yet. Bet he wishes he didn't break up with Carrie after all. Will Sebastian ever has a chance with Carrie again? Is there a potential secret romance brewing between Dorrit and George? Can Mouse ever forget the horror of playing turkey surgeon for the night? Share in the comments and post your thoughts on this week's holiday episode.